Ireland lives up to and will probably exceed your expectations. I may not have liked Paris but I will gladly recommend Ireland as a vacation spot. The following are reasons why you should visit the Emerald Isle. It’s the kind of natural beauty that belongs more in a fairy tale than an actual place. The greens you’ll see there seem supernatural in how lush and bright they are. The countryside especially is gorgeous with the occasional flock of brightly dyed sheep roaming around. The weather is incredibly mild year round, compared to the thirty to sixty inches of snow we get in Iowa. During the course of a single day, you’ll have bright sunshine and drizzly rain and then sunshine again. It never got over the 70’s while we were there in October so I didn’t need a coat most of the time unless it was raining. The rain there is light and doesn’t feel like you’re being attacked by tiny pebbles. The Paddywagon tours make it possible to see the attractions that are harder to get to without a car and they’re very reasonably priced. You can choose from day trips out to the famous Cliffs of Moher or the Ring of Kerry. Their buses are very modern and clean. The staff were all helpful and the drivers will give history/interesting tidbits while they drive to pass the time during the trip. Leprechaun houses. You’ll see more of these in the country than in the cities in Ireland. They’re about a foot tall in height and look like a very large bird house only with a door. 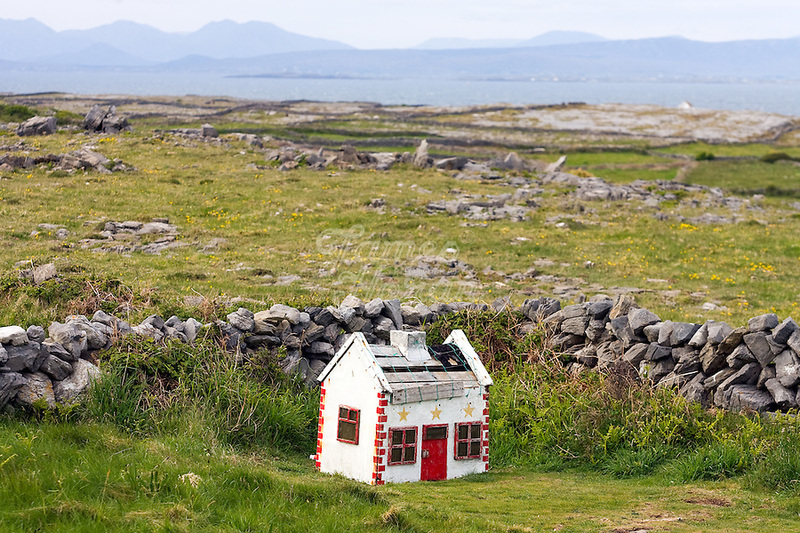 I tried to find information about why the Irish have these houses in their yards but I couldn’t find any definitive reason so I can’t give a reason why they’re a common sight but they’re a sweet way to represent their history of believing in leprechauns. This is a picture of one if you’ve never heard of them. The Guinness Storehouse tour. For about 16 euros you can tour their 5 story storehouse that have different themes for each story. The first floor is all about how the beer is made and features a waterfall you can walk “through”. You’ll learn all about the history of this well known beer in an interactive environment as you make your way up the tour. The fifth floor is where you’ll get a pint of Guinness to enjoy in their Gravity bar with 360 degree views of Dublin. Temple Bar-located in Dublin, the Temple Bar area is probably one of the better known night life areas in the world. There’s lots of pubs to choose from, but be sure to stop at the famous red Temple Bar and have a Guinness. Trinity College-this is Ireland’s top ranked university. It has a beautiful campus that feels like it belongs in Harry Potter. The Book of Kells is located on the campus which is a medieval manuscript of the four gospels of the life of Jesus Christ. The lines get kind of long for it so try to get there early to avoid a long wait. Aran Islands-you’ll need to take a ferry to get to the Aran islands but once you’re there you’ll have the whole day to explore the island before the next ferry comes. We chose to go with the horse carriage tour of the island instead of the more popular bus tour but we really enjoyed getting to talk to the carriage driver about the island and we liked having a more up close view of the island that a bus couldn’t give us. Kilmainham Gaol– this former prison probably looks familiar if you’ve seen the music video “A Celebration” that was filmed there in 1982 and it’s been featured in countless movies so you’ve probably seen it without knowing it. This prison was built in 1796 and has a long and storied history. This is well worth visiting to see their famous staircase and to hear more about the history of the prison. Their accents. Everyone loves an Irish accent. Some of the tour guides we had seemed to be playing up their accents but who cares, they sound adorable. The locals are some of the nicest people I have met in all of my travels and their accents are the icing on the cake. The Leprechaun houses are actually outhouses for before there was running water! Set to make an incredible come back if they try to charge us for our water!